Lainey’s Bouquets is a small flower farm at Nanoose Bay, in conjunction with Country Bay Manor Bed & Breakfast. 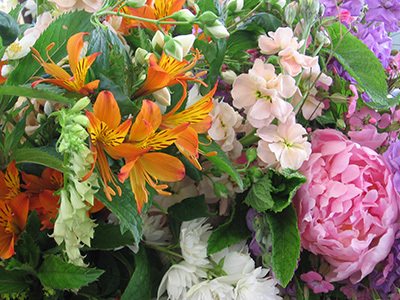 Lainey’s Bouquets grows specialty cut flowers for weddings, funerals and other events. Lainey’s also makes hand-tied mixed flower bouquets, which are sold at Springford Farm Store on Northwest Bay Road, Nanoose Bay. Customers can also choose weekly delivered flower bouquets, or they can pick them up at Lainey’s small farm stand at the gate.